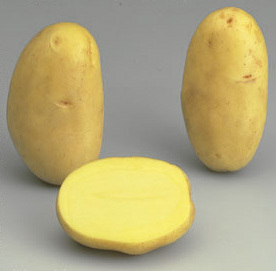 Tuber: Long oval, very shallow eyes to shallow, yellow skin, pale yellow flesh. Plant: Size Medium to high, semi-upright upright growth habit, intermediate type. Leaf: Medium green, semi-open to open; small to medium leaflet. Fruit: Moderately to very frequent.